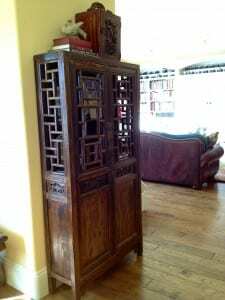 Aly & Bruce in Oregon sent photos of an antique Chinese cabinet they bought from us, and there is a very sweet story behind the purchase too! Aly found the unusual Late Qing Dynasty antique Chinese cabinet on our website and showed it to Bruce. He decided to surprise her and ordered it on the sly. She was thrilled! “My wife LOVES it!” said Bruce. 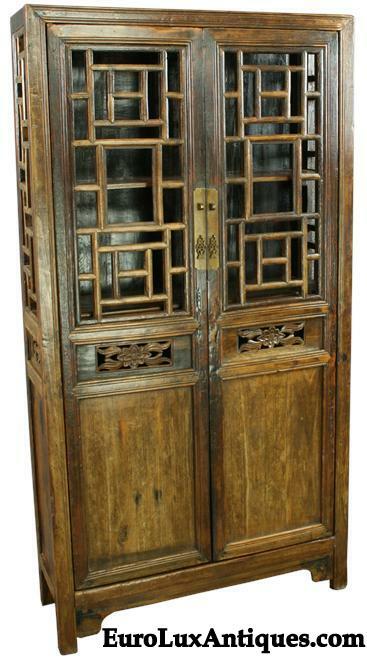 This is the antique display cabinet or bookcase in elm wood from the Shanxi Province in China. It dates to 1900 and features the four sided square design known as si ping. It was rescued from a home scheduled for demolition and we brought it to America. The antique Chinese cabinet looks wonderful in Aly and Bruce’s home. The unique geometric patterns on the doors and side panels really stand out. Geometric patterns were often used on antique Chinese furniture, symbolized lasting prosperity and the idea of infinity. The pretty hand-carved flowers may have held symbolic meaning for the original owner too. In Chinese culture, flowers mean growth, fulfillment, and prosperous new beginnings in life. The display cabinet makes a stunning focal point, especially as Bruce and Aly have ‘dressed it up’ nicely to display their collectibles. At just over 5 feet high, the cabinet looks like it was built for the space! “The piece is extraordinarily beautiful and fits perfectly right where I planned to put it,” said Aly. Bruce and Aly’s living room looks so comfortable and inviting. Although the antique Chinese cabinet could also work as a bookcase, we can see why the couple uses it as a display cabinet. 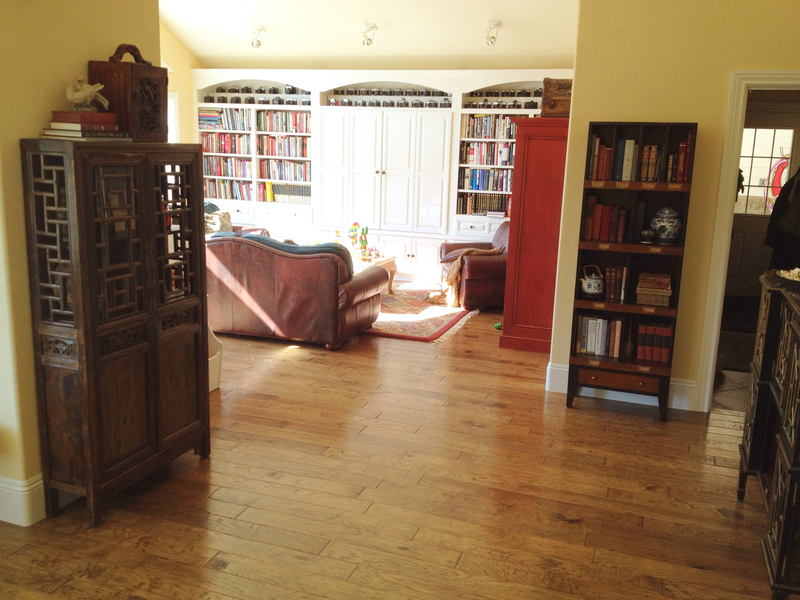 The living room already has ample shelving for books! I like the way they display other treasures in rows on the top shelves of the arched alcoves – it’s a great design detail. My previous Client Spotlight: Antique Chinese Folk Art Screen post shows another lovely Late Qing Dynasty example and tells you more about that furniture style. You can also browse the Chinese antiques currently in our gallery. Many thanks to Bruce and Aly for sharing just how fantastic the antique Chinese cabinet looks in their home! 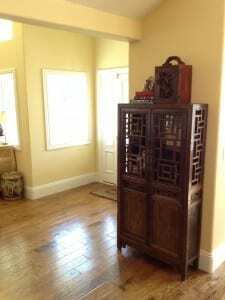 This entry was posted in Antique Furniture, Client Spotlight and tagged Antique Bookcase, Chinese Antique Cabinets, Chinese Antique Furniture, Chinese Antiques, Chinese Symbols, Chinese Symbols on Antiques, Late Qing Dynasty, Meanings of Chinese Symbols on March 6, 2014 by admin. 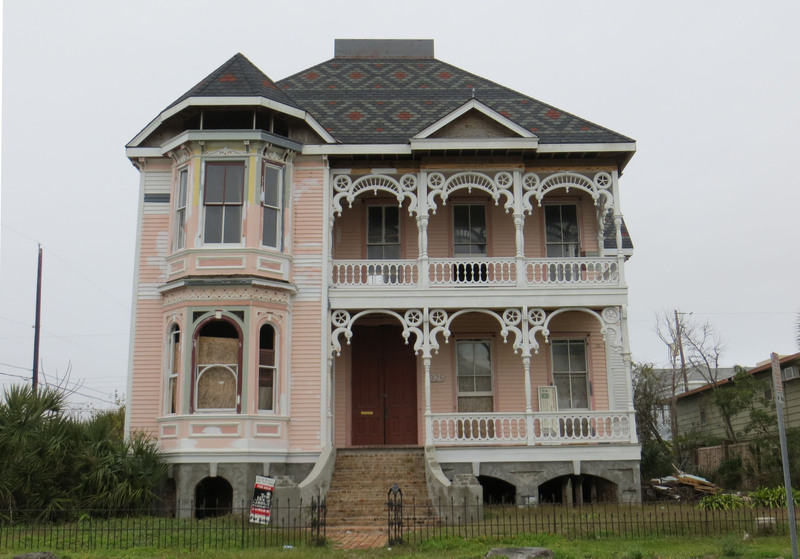 Angela M. recently bought several pieces of antique Brittany furniture from our gallery for the beautiful Victorian house that she is restoring in Galveston, TX. The 1890 Victorian was almost completely gutted by fire about two decades ago. 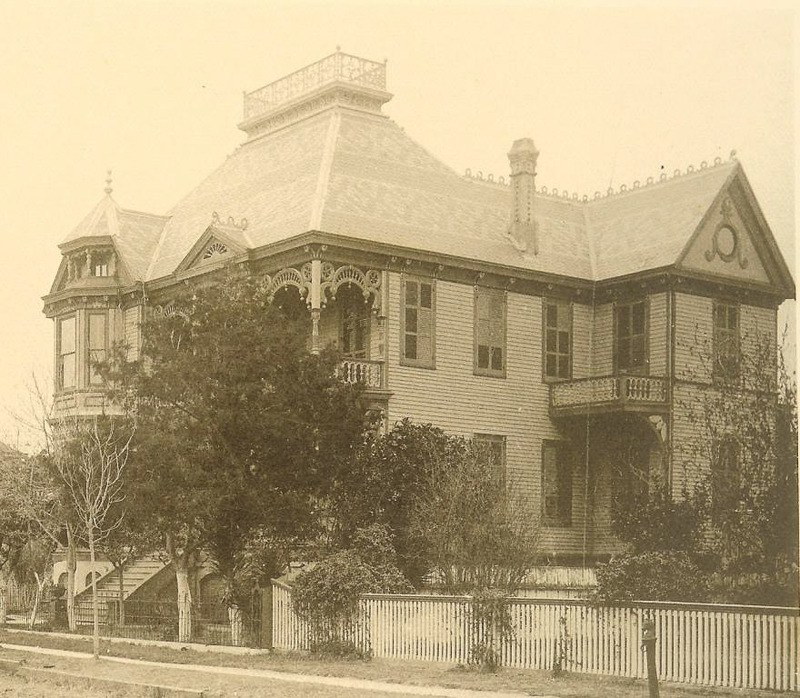 Here is the photo Angela sent us of the outside of the house as it looked nearly 120 years ago in the year 1894. And below is a photo of the house “under new management” last year. Isn’t it gorgeous? Angela says that the house is known for the lovely detailing around the porch of mariner’s wheels. The white paint on the porch really makes those wheels stand out! Antique Brittany furniture is a perfect choice for the interior. The Brittany style often features maritime details such as ship’s wheels in tribute to coastal Brittany’s sea-faring history. This is one of the pieces of antique Brittany furniture Angela chose for the house. It’s a display cabinet or bookcase dating to 1880, carved in chestnut with a beveled glass door. You can see the large ship’s wheel at the top of the French cabinet, tying in with the maritime theme of the house porch. The two galleries of spindles along the top and bottom of the bookcase are typical of Brittany style furniture. So are the hand-carved rosettes adorning the bottom drawer. 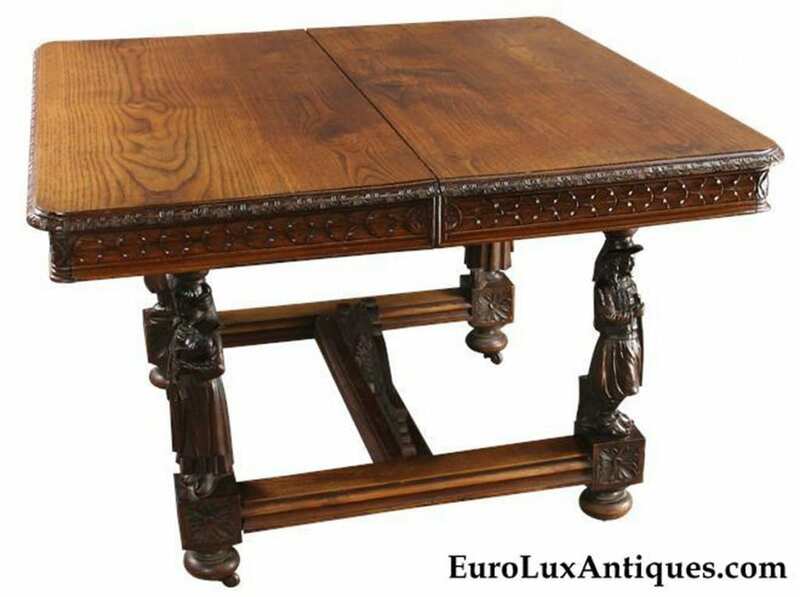 Angela also picked this Brittany style chestnut dining table dating to 1880. It’s a real stunner and the French craftsmanship is superb. Each leg boasts a carved figurine of a man or a woman wearing period regional costume. Carved figures of French country folk like these often decorate antique Brittany furniture. They are one of the most delightful characteristics of the style. The central stretcher beneath the table once again features a carved ship’s wheel. To match the table, Angela chose this splendid set of six Brittany dining chairs. 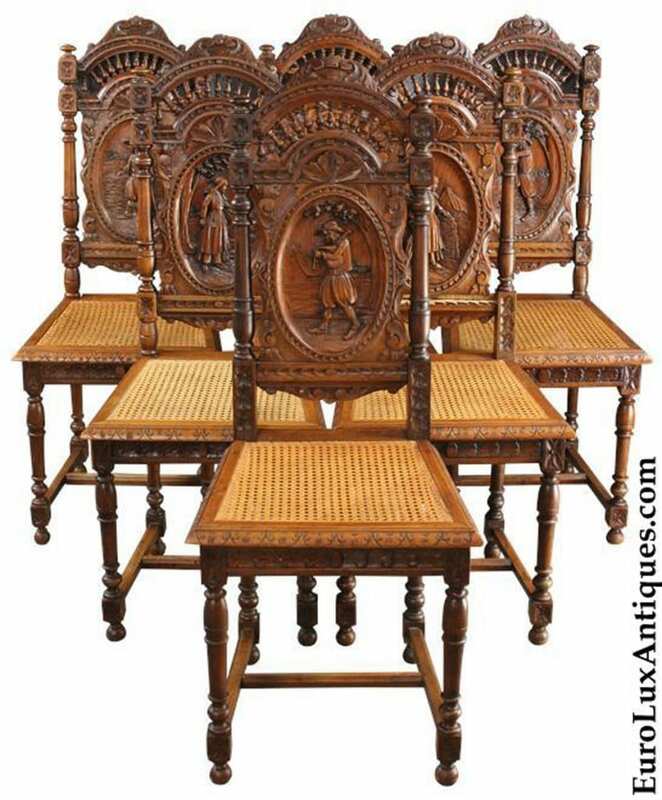 Crafted in France in around 1880, the chestnut chairs are carved with an arched gallery of spindles on the crest rail. Each chair back features a carving of a French man or woman in happy pastoral scenes. Some of them are playing bagpipes. If you’re wondering why French country folk are playing bagpipes – an instrument that normally makes us think of Scotland – here’s the reason. Brittany is historically a Celtic nation, like Scotland, Ireland, and Wales. Similar Celtic traditions and symbols appear in all those regions as they had such close cultural ties. Hence the bagpipes, which are often portrayed on antique Brittany furniture. We’re glad she gave in to temptation. She chose some exceptional furniture that will blend perfectly into the stately Victorian house and stay true to the exterior’s maritime theme. This entry was posted in Antique Furniture, Client Spotlight, Learn History & Styles and tagged Antique Bookcase, antique dining table, antique French Brittany, antique French furniture, Antique Furniture, Brittany Antique Furniture, Brittany Antiques, Brittany Style, Brittany Style Furniture, dining chairs, French antique dining chairs, French Antiques, Victorian, Victorian Homes, Victorian Restoration on October 10, 2013 by admin. One of the many great reasons to buy Antique Furniture, is that you are being ecologically conscious. By recycling an antique piece of furniture, you are choosing not to cause more trees to be cut down and are reducing the negative impact of manufacturing processes in countries like Indonesia. You can feel good about being Green and reducing your ecologic footprint by buying Antiques! French Antique Furniture can also be repurposed, or used in different ways than that which it was originally intended. For instance, a new trend for 2011 in kitchen design is using Antique Buffets, Antique Armoires, or Antique Sideboards as free-standing kitchen cabinets. Our customer Gregory M. thought of a unique way to repurpose an Antique Bookcase into a beautiful Gun Rack for his lovely vacation home in Butler, Georgia. This striking Antique Bookcase was easily repurposed by adapting the existing shelves and adding a rack for the gun barrels. The same process could convert a large Antique Bookcase or Antique Buffet into a wonderful way to store your wine collection! We would love to see photos of Antique Furniture or Accessories from EuroLux Antiques in use in your home! This entry was posted in Client Spotlight and tagged Antique Bookcase, Antique Furniture, Antique Gun Rack, Reason to Buy Antique Furniture, Recycled Furniture, Repurpose Antique Furniture, Repurpose Antiques on June 20, 2011 by euroluxantiques.